Want to play a role in bringing next generation UHD products to the global market? 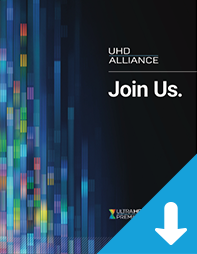 Join the UHD Alliance to partner with some of the biggest names in consumer electronics and entertainment to help grow the UHD ecosystem. If you are interested in joining the UHD Alliance or would like to learn more about our membership levels, please contact: admin@members.uhdalliance.org.